(PRLEAP.COM) The British insurer Aviva, which is the second largest property and casualty provider in the country, now says it is ready to tackle Canadian problems through its Aviva Canada division. Indeed, during the last year, Canada has been Aviva's toughest market. The company admits the troubles are from major weather events; and in recent earnings call lamented the fact it cannot "control the weather". Last week, Aviva's financial results for the first half of 2018 revealed Aviva Canada stood out from its other divisions in all the wrong way. Indeed, the division had a combined operating ratio (COR) of 104.6%. Considering Aviva's target was between 94% and 96%, it is easy to see how Aviva Canada is causing issues for the company. 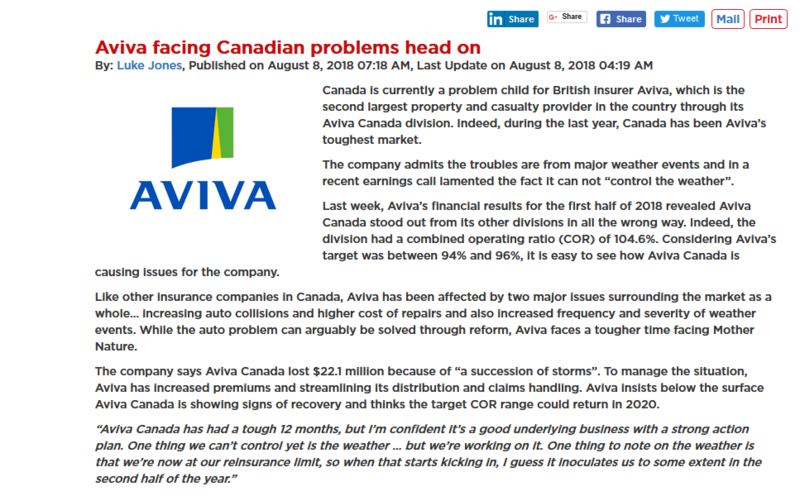 Like other insurance companies in Canada, Aviva has been affected by two major issues surrounding the market as a whole… increasing auto collisions and higher cost of repairs and also increased frequency and severity of weather events. While the auto problem can arguably be solved through reform, Aviva faces a tougher time facing Mother Nature. The company says Aviva Canada lost $22.1 million because of "a succession of storms". To manage the situation, Aviva has increased premiums and streamlining its distribution and claims handling. Aviva insists below the surface Aviva Canada is showing signs of recovery and thinks the target COR range could return in 2020. "Aviva Canada has had a tough 12 months, but I'm confident it's a good underlying business with a strong action plan. One thing we can't control yet is the weather … but we're working on it. One thing to note on the weather is that we're now at our reinsurance limit, so when that starts kicking in, I guess it inoculates us to some extent in the second half of the year." Shop Insurance Canada is a subsidiary of RDA Insurance, a major Ontario based insurance provider with a stable of online outlets that includes Shop Insurance Canada family sites. The company has two goals, to give you the very best insurance policy possible and to help you save money when looking for coverage.